Organized in 1925 by public referendum, the District now owns almost 90 miles of trails and approximately 65 forest preserves consisting of more than 19,231 acres, as well as greenspace located throughout Kane County. 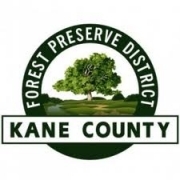 The Forest Preserve District of Kane County Commission that governs the District is comprised of 27 commissioners who are elected as County Board members (one is elected County Board Chairman) and also serve as Forest Preserve commissioners. The Commissioners elect the President of the District to two-year terms. The Executive Director serves as the operations and administrative head of the District and she appoints officers and Committees, with the approval of the Commission. The Commission and the Executive Committee handle the District business of preparing policies and acquisition of open space for the citizens of Kane County. The District employs 71 full-time and 2 part-time employees and approximately 43 summer seasonal employees and 18 year-round seasonal police officers. The headquarters is located at Suite 320, 1996 South Kirk Road, Geneva. Satellite offices are located at the Tekakwitha Woods Nature Center (McGuire House), Trades (Campton FP), Natural Resources (Aurora West), North (Muirhead Springs FP) and South (Grunwald Farms FP) Operation Facilities. The District owns three (3) golf courses: Settler’s Hill, Hughes Creek and Deer Valley. Philip B. Elfstrom Events Center is home to the Kane County Cougars, a minor league baseball team. The District also owns the Fox Valley Ice Arena where the headquarters are located and home to the Chicago Hitmen, a minor league hockey team.